Next week the Petrie Museum of Egyptian Archaeology is exhibiting at LonCon3 – the largest science fiction (SF) convention in the world. We’ll be there alongside exhibits on Doctor Who, Iain M Banks, academic posters on SF and English Heritage. But why is a museum of Egyptian Archaeology going to this mahosive SF convention? A good question. I was going myself, being a bit of a geek and knowing a few people also going. Then I got approached separately by the exhibits hall organisers to see if the Petrie Museum would put on a display on what we do. ‘You mean our SciFi trail around the museum?’ I asked. But I was told SF people know all that stuff anyway and SF fans are interested in archaeology, science, Egyptology; wouldn’t it be great to showcase some of what we have in London to 1000s of SF fans who have come from all over the world? Plus it was happening in August – usually a slightly ‘dead’ time for public events due to holidays, lack of UCL students etc. And so, the Petrie is off to show our wares, talk about what we do to as many people as possible and generally enjoy the atmosphere. 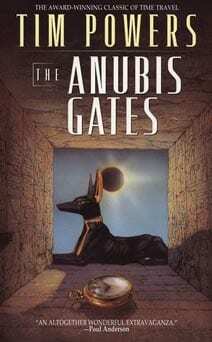 Fittingly there is also a production of Tim Powers’ The Anubis Gates, a fantasy novel using ideas about Ancient Egyptian magic, which has served as some of the inspiration for our Autumn Programme at the Petrie. We are using the idea of creating real and imagined gates from London to Egypt – you can find out more on our first mapping session with James Kneale (UCL Geography) on 24 September. We have loads of events from a talk on Kenneth Anger’s Lucifer Rising and Aleister Crowley to Penny Dreadful and Fin de Siecle Egypt with Roger Luckhurst as well as a special performance on Halloween of The Gentlemen of Horror: Mr Cushing and Mr Lee (the Metro’s ‘pick of the Camden Fringe’) about the Hammer Horror actors who immortalised The Mummy (1959). Before all that though, I’m running a Petrie Museum monsterclass on ‘Archaeological World Building’ at Nine Worlds Convention: Geekfest 2014 this Friday. In this I’ll be making connections between how archaeologist Flinders Petrie ‘created’ civilisations from early Egypt through tomb cards and evidence collected, asking people to make their own ‘world’ from a famous tomb card and considering how the conclusions made can be ‘right’ or ‘wrong’ (not so much of an issue in SF writing!). If anybody reading this blog is going to either Geekfest or LonCon3 please do pop by and say ‘hello’; even better come to one of our Fantastical Egypt events this Autumn!